Power supply: No need additional power supply. 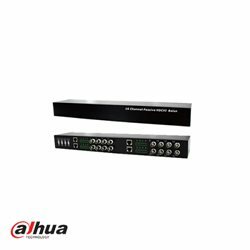 Transmission effect: Real-time transmission HDCVI video signal without compression, video is clear and stable. Transmission distance: 0~400M(with passive transmitter). Main functions: Use 4 wires meanwhile to transmit 16-ch video signal. Protection and anti-interference: Excellent anti-thunder, anti-static and anti-interference capabilities. Appearance structure: BNC coaxial interface, the green has screw terminal and crystal head twisted-pair cable interface.